Iron ore + coke + limestone ==heat==> pig iron. Steel industry also requires dolomite, manganese etc. but in small quantities=> their presence is not the main deciding factor for the location. Until the end of medieval period, iron production was done on small scale. Energy was immobile (No wires to move electricity, No trains to move coal). To produce five tons of iron, you had to chop down one acre of forest to get sufficient charcoal. The coalfield region had a tradition of iron working based on charcoal as a result coalfield areas already had the labour and technology. During that era, to process 1 tons of iron ore, you needed 8-12 tons of coal. Railway engines were also inefficient. So, weight-wise, it was cheaper to transport iron ore to coalfields rather than transporting coal to iron ore site. Why do we need “Coking coal”? Because Iron ore=has iron oxide. But We’re only interested in iron. So, we’ve to get rid of the “oxide” part. Then how can we remove the “oxide” part? Ans. Make him marry with carbon and form “Carbon dioxide”. But where will you get the carbon? Ans. Coking coal. Because Coking coal has high concentration of carbon, compared to cheap varieties of coal like Lignite. Therefore you’ve to mix the coking coal with iron ore.
Iron Ore (Iron Oxide) + Coking Coal (source of Carbon) + Limestone (reducing agent)=heat*=> Iron + CO2 + slag. *for heating you can use other variety of coal / even electricity. By early 20th century the coal and iron ore mines in US-Europe started getting depleted. So, they started importing iron ore from other countries. As a result the iron space and steel industry started moving toward coastal sites to reduce cost of transporting ores from port to factory via railways. Malaysia Has iron ore but not enough coalTherefore steel plants located near coastal area to get imported coal @minimum transport cost. The returning wagons after emptying coal, bring iron ore from Ural region. Result=> iron-steel industry developed @both places. This optimizes the use of transportation (because wagons are never empty), and helped in growth of iron-steel industry @both places. 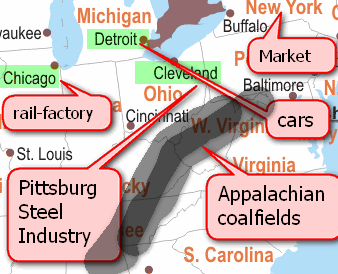 Pittsburgh (Pennsylvania State) =steel industry was started using local iron ore and coal. Problem: ships would bring iron ore but on their return journey, they’d be empty=> uneconomic use of transport. So, they started transporting Pittsburg coal to Lake Superior region in those returning ships=>steel industry developed in the lake region as well. But Since Pittsburgh itself is not a coastal city, so the coal/iron had to be transported to a port (Cleveland) first using railways. Thus, Cleveland (Ohio State) didn’t have iron ore or coal, yet got access to both => iron-steel industry developed in Cleveland. Same reason for Duluth in Minnesota. Sweden has high quality iron ore, yet it specializes in non-ferrous metallurgy and light engineering, (rather than iron-steel industry), why? Because Sweden lacks cocking coal. Sweden exports its own iron ore to Ruhr (Germany) and in return imports pig iron from Ruhr. Then Sweden converts imported German Pig iron into steel, using electrical furnaces. (Advantage: cheap hydroelectric power, because Sweden = hills + fast flowing rivers). but since imported pig iron=costlier (than if they had made it locally)=> the steel thus manufactured, is used for making high value items e.g. Volvo Cars, Bofors Guns etc. Open hearth system even scrap metal can be used to make steelreduced fuel consumptionEven natural gas can be used. Oxygen converter process Further reduced coal/energy requirement. Combined with the invention of electric smelters, technology helped in development of Mini-steel plants near industrial cities (And away from iron-coal reserves). Today, coal is not the only source of energy. We’ve natural gas, hydel electricity even nuclear power. + Thanks to new technologies in steel production, you don’t need massive amt. of coking coal. But still traditional industrial areas are located in and around the coalfields- sometimes even after the coal mines have exhausted, these industries are not shifting to a different location. Example Lancashire in UK; Ruhr in Germany; Pittsburg in USA. When industries don’t move away from an area, despite the locational disadvantage= this phenomena is called industrial inertia. Transport The railroad, transport and communication infrastructure = well-developed in the old area. Therefore, even if local raw material supply is exhausted, they can be imported from other areas. It takes a lot of time and money to build a factory and equip it with necessary machines. This discourages the entrepreneur from shifting to a new location, especially for steel industry, heavy engineering works, petrochemical refinaries. It is usually cheaper to modernize or expand an existing location rather than move to a new site. For example, as cotton industry of Lakeshire declined, they converted textile mills into light engineering goods factories, rather than moving to a different location. Iron and steel industries provide raw material to many secondary manufacturing industries such as automobile, heavy engineering etc. If the primary industries moved to new location but the corresponding Customers (automobile/heavy engineering industries) don’t change location, then it will affect profit levels. This is like “pahele Aap, Pahele Aap” (you go first, no no you go first..) but nobody moves from old area for the fear of losing profit=>industrial inertia. The industrialists in old area usually have deep pockets and political connections so they lobby to government for favorable protectionist policies +large labour population in old area=vote bank. For example, Pittsburg is not a coastal city and nearby coal-iron ore reserves are getting depleted=> it was becoming more expensive to produce steel using imported iron-ore. But then Pittsburg industrialists lobbied, and US government made steel-pricing policies like “Multiple Basing system”, “Pittsburg plus” etc. (in the early 1900s). The impact of such policies => even if you can make cheaper steel in some other place of US (e.g. Southern Coastal areas), you still need to sell it @prices equivalent of Pittsburg steel industry. This demotivates entrepreneurs from setting steel-factories elsewhere, because they can’t sell their product cheaper than Pittsburg, to attract more customers. In July 2013, POSCO (Korean steel giant), pulled out from the steel-mill project in Karnataka worth almost $6 billion FDI, due to bureaucratic red tapes in environmental clearances and land acquisition. We can only speculate the vested interests and powerplay going on behind the curtains involing bureaucrats, politicians and mining mafias. After WW2 and from the lessons of Aerial bombings destruction in Britain, US government decided that it was not wise to let entire steel-industry concentrated in the East (Great Lakes-Pittsburg region). Therefore, some plants were setup in the west (California). They get coal from Utah and Iron Ore from Eagle Mountains. Before Second World War, Ukraine-Donbas region was famous for iron steel and heavy industry. Due to this bad experience, the Soviet government adopted a policy to disperse Soviet industries on the Eastern side, towards the Pacific coast. Steel industry was setup specifically @Bhilai to reduce the regional backwardness. “Backyard steel furnaces” were setup in every commune under the “great leap forward” policy of Mao. Although Mao’s “backyard” idea was an #Epicfail, we’ll see in the next article on steel industries! sir wen u r coming wid the rest of industries…….only three months to go……sir plz fast.. I need to know if there is any specific geographical reason ( like iron formation) for distribution of iron ore in India and around world. Like major iron ore deposits in Indian are found on eastern side. So with specific reason it will be easy to get through iron ore distribution across the world having nearly similar conditions. when can we expect the next two installment of the Geo series ?? hi..when will you publish remaining portions for geo…eagerly awaiting!! Mrunal Sir, u r doing a great service to all civil service aspirants with such useful articles..any other person would have charged a hefty fee for all this material..Thanks a lot!! I think by mistake you have written limestone as reducing agent,while it actually act as a flux and Coke act as reducing agent..Please specify sir. Mrunal bhai, no words can tell how your works cool off fear about each and every topic.